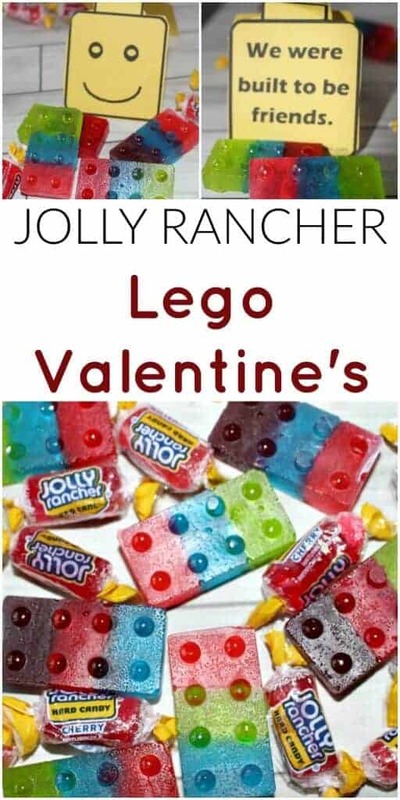 Looking for a super easy Valentine’s treat? 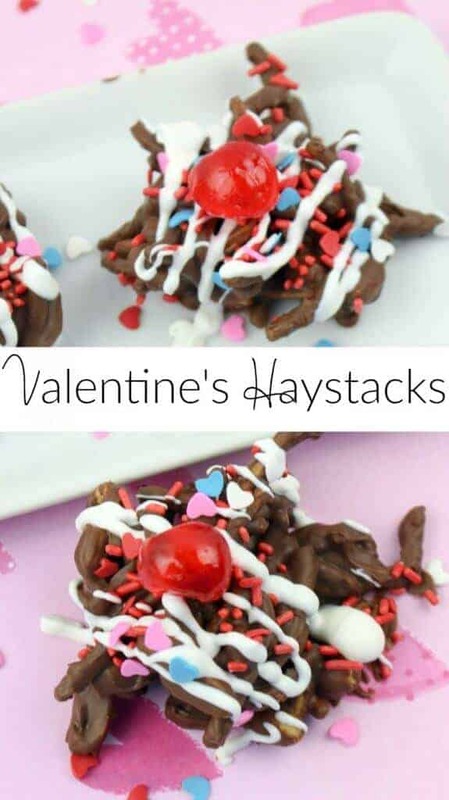 These Valentine’s Haystacks are just the ticket! 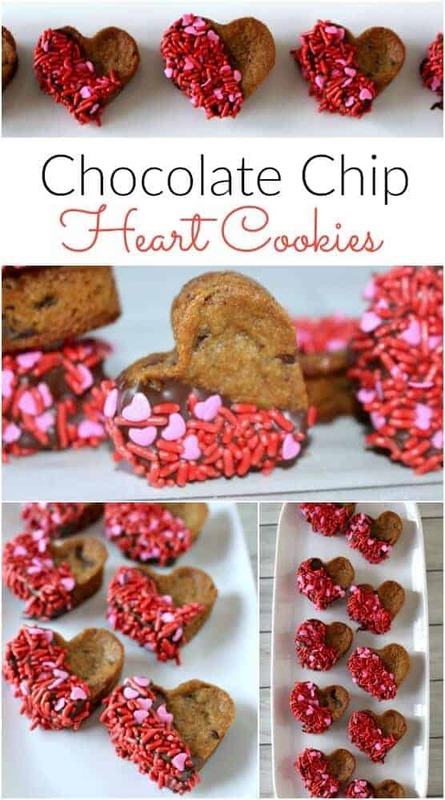 I love Valentine’s Day and I am always looking for super easy desserts and treats to make for my kids and for their classroom parties! These are great – they take no time to make, you can keep them for up to two weeks and the only “cooking” involved is melting the chocolate! 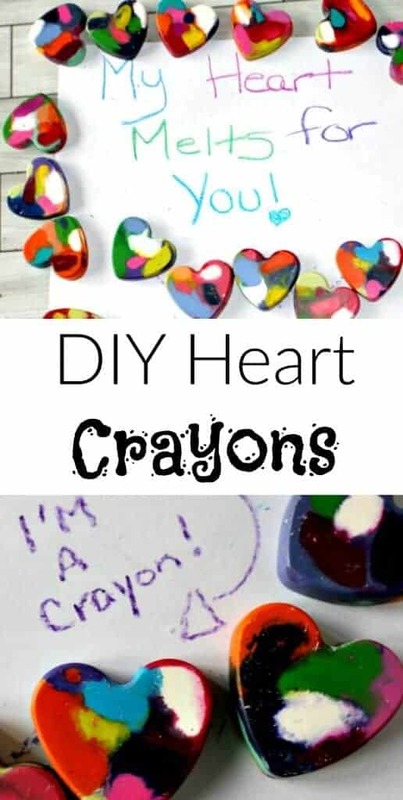 If you are looking for more great Valentine’s Day idea – check out all of these!! Line a large baking pan with wax or parchment paper. Set aside. Add the noodles and peanuts to a medium mixing bowl. Gently toss to mix. Set aside. In a double boiler, melt the semi-sweet chocolate chips over low/medium heat, stirring occasionally. Remove from heat and cool for 2-3 minutes. 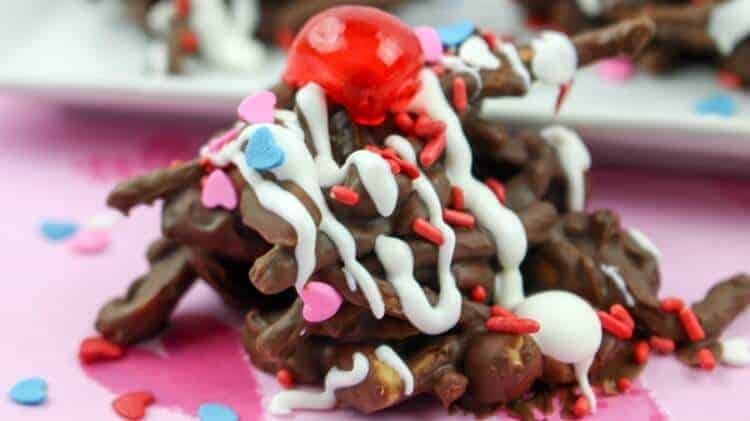 Pour the melted chocolate on top of the peanuts and noodles and gently toss to coat. Transfer the mixture onto the lined baking pan, in the shape of “haystacks.” I used a Tablespoon but a cookie scoop would work, also. Sprinkle each haystack with the red jimmies. Place a halved candy cherry on top of each haystack. Sprinkle with the heart-shaped confetti sprinkles. Chill for 20 minutes to allow the chocolate to harden. ENJOY!! 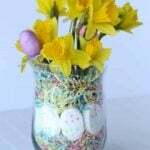 You can store the haystacks in a single layer in an airtight container for up to 2 weeks. 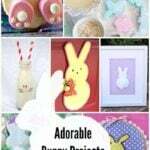 Looking for more Valentine’s Day Treats – check out some of my others! I live in the UK and therefore my idea of chow mein noodles may not be the same as yours! To me these are either uncooked noodles in a packet ready to be boiled and added to a dish or ready-cooked noodles ie preboiled to be added straight to a dish. Some years ago I lived in the USA and I do have a recollection of noodles added to snack mixes which I think might have been deep-fried so my question is are these the type of noodles (i.e. the latter) you are using in your haystacks? They are ready to eat crunchy noodles! They usually come in a can or bag – ready to go, no boiling needed.